Background: The following essay was published in the monthly published for those active as Nazi Party propagandists. The essay is a balance sheet on Nazi propaganda after the first year of the war. It provides a wide range of statistics on propaganda activity. 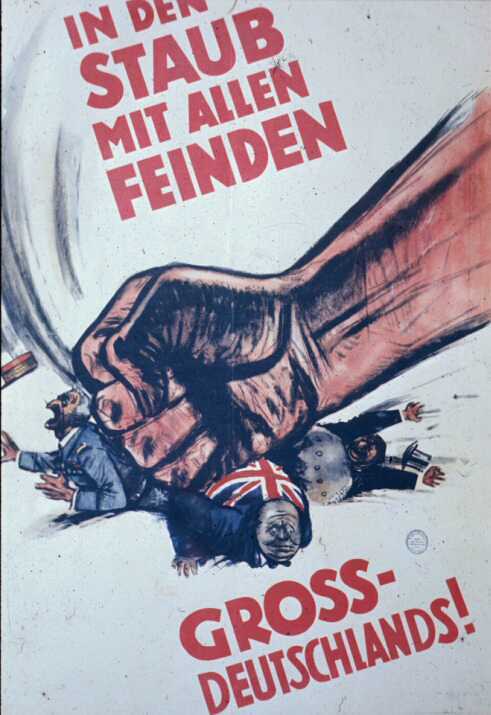 The source: “Die Arbeit der Partei-Propaganda im Kriege,” Unser Wille und Weg, 11 (1941), pp. 1-12.
more than 60 million newspapers, wall posters, leaflets, etc. The Technical Team “Germany” assisted in about 50 major events and drove over 360,000 kilometers (nine times around the earth). More than 30 million soldiers received relaxation and entertainment from films shown by the party. The Dr. Goebbels Radio Fund provided nearly 6,000 radio receivers as well as thousands of tubes and other spare parts to needy citizens. When the movement in general and propaganda in particular at regular intervals looks back on its work, it does so not to take satisfaction or pleasure in what has been accomplished, but rather to evaluate the work. Effort and success are compared, and the work is examined to see what success it had and what possibilities for improvement exist. What was true for propagandists during the struggle for power is even more true during war. People must work independently and creatively, without waiting for instructions from above. As precise and detailed as guidelines may be, they can be given only with regards to the situation in the entire nation. The task of local propagandists is to apply these guidelines to the local conditions, to find the right methods to reach the goals they are given. The following numbers and facts prove that this task is being met, even when one considers that it is not being carried out by a fully-staffed and experienced team. From the first weeks of the war, propagandists, too, exchanged the brown shirt of the party for the gray uniform of the military. 50% or more of our propagandists have joined the forces. In their place came party members transferred from other areas, who often could not be given any training, but who nonetheless have risen to their jobs. The accomplishments in the following report are the result of untiring effort and the effective cooperation of old and new propagandists. They should spur us on for the work that is ahead. Each propagandist fights at the place where the movement has put him, joining in the battle for the future of our people. The war has shown once again that speakers and meetings are the main method of propaganda in leadership and education. In these times above all, the speaker is the intermediary between state, party, and people. The meeting is and remains the forum at which the questions of our day receive a powerful, full, and vivid treatment. Extraordinary demands were put on our speakers. More than a third of our 9800 national, shock, Gau, and other speakers were called to arms. Cuts in train service and gasoline shortages and other such war-related difficulties also caused difficulties. More than that, speakers carry on their work alongside their main jobs in the party or in the economy, jobs which also demand more of them because of the war. Nonetheless, despite the smaller number of speakers, the number of meetings and mass meetings is not smaller, but rather larger than in the year before the war began. There were numerous difficulties in carrying out meetings. One need only recall that, particularly in the west, many rooms and halls were occupied by the troops, that many such spaces were used to store grain, and that at the beginning of the war many towns and villages were evacuated. Since summer 1940, the danger of air raids in the western and northwestern regions have made holding meetings more difficult. It is also necessary to take into account the jobs of the people when planning meetings, e.g., the pressing necessities of the farming economy and the increased demands on those citizens working in the armaments industry. Between 1 September 1939 and 31 July 1940, 156,143 meetings were held. Of these, 106,597 were political meetings and mass meetings, 49.546 were factory mass meetings. An estimated 30,000 to 35,000 additional meetings and mass meetings are estimated to have been held during the period from 31 July 1940 to 15 December 1940. That is a total of about 200,000 meetings. Alongside these political meetings and factory mass meetings, there was the successful campaign “Meetings of the Youth,” which began on 1 April 1940. 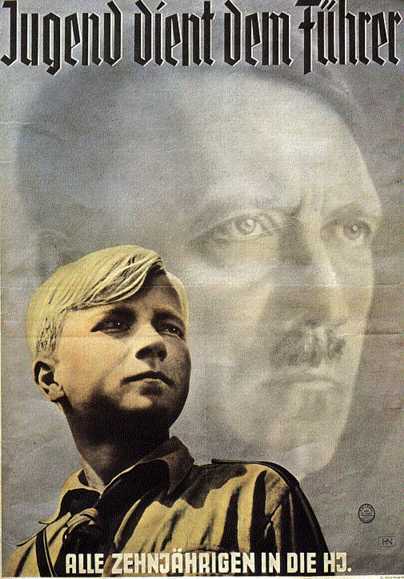 An exact attendance figure is not available, but it is clear that from the start of the campaign to 30 November 1940, all members of the Hitler Youth have attended at least one such meeting. A campaign using military speakers in the public meetings of the party, its subsidiaries and affiliated organizations, as well as in membership meetings and discussion evenings, began on 1 April 1940. 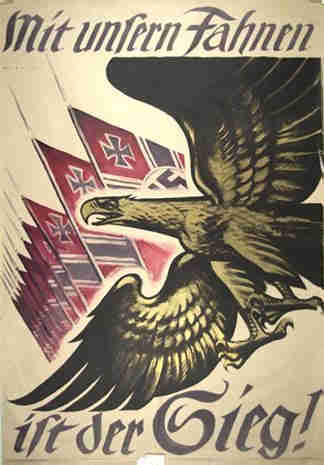 Increasing numbers of political speakers are sent by the Reichspropagandaleitung to military units, both in the Reich and in the occupied regions. The steadily rising requests for party speakers shows that the Wehrmacht is not only satisfied with this measure, but wants to increase it. Simultaneously, the Reichspropagandaleitung is sending speakers to the work camps of the Organisation Todt to inform citizens, wherever they may be, of political events. The first wave of the meeting campaign ran from 1 November to 15 December. It was the first use of a new style of meeting. The intention of the RPL was to develop as unified approach as possible to reach all districts during the winter propaganda campaign, something particularly important during war. The first reports published in December show that not only was the goal reached in its entirety, but this style of meeting found particular approval both with propaganda offices and the public. The RPL made 3,000 speaking dates available to the Gaue. The 500 Gau speakers assigned by the RPL spoke to about 4,000 meetings. Since the RPL speakers who provided the 3,000 speaking dates often spoke more than once, they, too, spoke to at least 4,000 meetings. Thus, a total of about 8,000 meetings were held during the first six weeks of the meeting campaign. There were other meetings as well that were not part of this campaign, but nonetheless fit into the winter campaign. The use of slides has grown year by year since their first use by the party, and has become one of the most important means of propaganda. They are particularly important in areas that lack a movie theater. But their value is not limited to those areas. They are also valuable in those areas where the populace is able to follow the warâ€™s events on film. 37 presentations by party divisions or affiliated organizations treating general issues and current events also used RPL material. Slide shows produced by the German Popular Education Society are not included in this total. The extraordinary interest these slide shows arouse is shown by the fact that the 41 Gau offices held a total of 29,674 slide evenings during period, with a total attendance of around 4.3 million. This does not include slide shows in schools or those held by the German Popular Education Society. The Weekly Picture Report, which deals with current events, is produced in an edition of 1,575. We may not ignore the work of the Gau offices with the military. In the 14 Gaue with military bases, 1,147 slide evenings were held with 130,000 attendees. In each case, the RPLâ€™s Weekly Picture Report was shown. The outbreak of the war had only a temporary effect of the Film Departmentâ€™s work in those areas without a movie theater. After the technical difficulties were overcome (train transportation, surrender of vehicles to the army, gasoline rationing, etc. ), the film work continued with the resources available. Despite the numerous remaining difficulties (air raids, etc. ), the fact that the Gau film offices present the best new films and that people have great interest in the weekly newsreel means that the partyâ€™s film showings are visited more than they were during peace. To meet the demand, personnel and equipment must be used to the fullest possible extent. The party film offices have 906 vehicles and 908 projectors at their disposal. 222 vehicles and projectors are used exclusively for the military. The remaining vehicles and projectors are constantly in use to meet the demand. The work necessary and the distance traveled becomes clear from the fact that 45,000 film presentations are held per month in areas without movie theaters alone. Nine to ten million citizens see both the latest films and the German Weekly Newsreel. In addition, the film shows held in the camps for Germans who have returned to the Reich from the northeast and southeast of Europe reach about 80,000 to 100,000 monthly. Between 1 January and 30 September 1940, 33.7 million adults and 6 million youths were reached by party film shows. The RPL Film Officeâ€™s film The Campaign in Poland was a tremendous success. As of October 1940, 7.8 million had seen the film in regular theaters, 3.4 million in areas with no regular theater, and 2.5 million in schools, a total of 13.7 million. The RPLâ€™s second film of the war, The Eternal Jew, was released at the end of November 1940. The military provided the film office with another broad field of activity. As already mentioned, about a quarter of the partyâ€™s film vehicles and projectors are used to serve the military. This will grow in the future. Since these figures include only activity to the end of October 1940, before the two particularly popular months for film of November and December. These figures will certainly be significantly higher by the end of the year. The cancellation of a series of annual celebrations and the requirements of the war led the RPLâ€™s Cultural Office to concentrate its efforts in two areas: the partyâ€™s necessary political ceremonies and on work related directly to the war effort. To meet the requirements of the first area, the cultural magazine Die neue Gemeinschaft provided guidelines, advice, suggestions, and stage sketches for arranging the room, the course of the ceremony, the speech, and supporting elements. Appropriate songs, music, literature, and other materials were also provided. To keep in constant and direct contact with the people, and to provide them with answers and guidance on proper behavior, a variety of propaganda is necessary alongside meetings and other gatherings. Guidelines and regulations provide immediate guidance for fast-breaking events. Guidelines for the winter propaganda campaign 1940/41. Hand in hand with providing directives and advice, etc., to the propaganda offices and the carrying out of meetings, mass meetings, and slide and film evenings to educate the people, printed matter of varying types is also produced. In addition, there is the confidential information for speakers, the special editions of the speaker information material, the brochures in the series “The HJ meeting system,” the texts accompanying the slide shows, the mass-produced brochure “107 Lies in Eight Weeks,” the brochure “Prisoners of War,” etc. Around 700,000 pictures of the Führer have been provided to newly incorporated German areas in the east and west, and to military forces stationed there. Two posters, each in an edition of 23,000, were produced for the film The Eternal Jew. as well as banners, flyers, etc., were produced. More than 200,000 posters were produced for slide shows. Around 700,000 posters to announce party meetings and 1,300,000 for meetings of affiliate organizations were also produced. The wall newspaper of the Reichpropagandaleitung, the Slogan of the Week, appears weekly, along with several special editions and supplements. A total of 8 million copies have appeared. The Picture of the Week appears weekly in an edition of 32,000. Since each includes four pictures, the total is 128,000 pictures weekly. The greatest changes in the whole propaganda system since the beginning of the war have probably been in the area of radio. The radio organization of the party was as well prepared as all the other organizations, but it was the only area to see a fundamental change in its manner of operation. Numerous new tasks replaced those that had been eliminated by the war. Until listening to foreign radio stations was banned, the radio organization had the task of jamming enemy transmissions as much as possible. In conjunction with the propaganda companies, it helped make propaganda to the enemy lines and positions along the West Wall during the period of quiet. This required remarkable efforts, both in propaganda and technical matters. Although there is no firm evidence, it is nonetheless clear that these efforts had an great psychological impact on the enemy and helped to breach the enemyâ€™s morale. In cooperation with other organizations, the cable system was expanded rapidly. This was done particularly in areas in areas where radio transmissions were stopped for strategic reasons or because local transmitters were shut down for a period, or where there was a risk of them being attacked by the enemy from the air. The cable system guaranteed that news could nonetheless be sent, as well as allowing for community listening to important events. The loudspeaker vehicles played a particularly important role. Part of the available vehicles were turned over to the army at the beginning of the war. The remaining vehicles were particularly needed in the west to provide the daily news to those areas not reached by the cable network. In cooperation with the police, our radio men also collected radio receivers formerly owned by Jews. After they were inspected and repaired, half were turned over to the army for use by the troops. In addition, Reich Minister Dr. Goebbels asked for donations of radio receivers for the military. After they had been collected and repaired, about 5,000 were turned over to the military. The partyâ€™s Gau offices provided 6,000 receivers, and an additional 10,000 came from Poland. In all, the military received about 60,000 receivers with a total value of nearly 4 million marks for use by the troops. Another duty of the radio organization is to provide low income citizens with radios from the “Dr. Goebbels Radio Fund.” This continued despite the war. 5,640 radio receivers have been provided by Reich Minister Dr. Goebbels since the war began, along with 1,300 tubes and 3,200 other parts with a total value of about 145,000 marks. The war has brought with it particular difficulties with regards to batteries. The radio organization was responsible for seeing to it that those available were distributed fairly, above all to areas where they were necessary to ensure continued reception. The introduction of ration cards signed by the local radio official resulted in fair distribution. The reincorporation of areas in the east and west into the Reich brought particular challenges. Here work had to begin from scratch. The first goal was to erect loudspeakers and transmission facilities, as well as receivers to enable community listening. Radio officials, particularly those in Gaue formerly along the border, had important roles. This work was conducted despite the war. To deal with a shortage of community receivers, a new community receiver was developed for the NSDAP and the party's divisions and affiliated organizations. 20,000 will be produced in 1941. Assistance for the war winter propaganda campaign 1940/41. In the space available it is obviously not possible to give the statistics for every area of activity. It is even less possible to discuss everything done by the Reichspropagandaleitung and its subordinate organizations, particularly during the war. This review at the beginning of a new year must not get lost in details. Rather, it should give propagandists, each of whom is aware primarily of his own area, the big picture of propaganda activity. We, the Führerâ€™s propagandists, can look back with satisfaction on what we have accomplished. The achievements and statistics are unprecedented. They testify to the smooth cooperation of everyone involved. Without our united efforts, it would never have been possible to achieve the assigned tasks and accomplish so much. Looking back on our accomplishments will spur us on to continue doing our duty for the Führer and the nation. The second half of the winter war propaganda campaign is before us. The first half, as we have seen, was a great success. We National Socialists do not see past successes as unsurpassable in the future. Such accomplishments and successes in the past have always spurred us on to do even better the next time. With this desire, we begin the second wave of the war winter propaganda campaign. It will be a new high point in our propaganda activity.